This video was designed to introduce myself and my Procreate 4 User Guide – Basics video tutorials. The 11 videos of the Procreate 4 User Guide Basics series are beginner level. They total over 60 minutes of material. Here is a summary of what each video covers. This video reviews the iOS Procreate 4 Advanced Settings, such as what you allow Procreate to access and choosing functional settings like whether to include rotating with pinch zoom, whether to have palm support and determining your time-lapse recording quality. I explain the different options and share my choices. Though referred to within the Procreate User Interface as “Advanced” Settings, I consider a quick review of these settings as useful for a novice Procreate user. These settings can enhance the user’s Procreate experience. This video reviews the Procreate 4 Gallery functions, including how to organize images into “stacks”, how to move, duplicate and delete images in the gallery, how to import files and generate a new blank canvas. This video I take you on a tour of the Procreate 4 Preferences, explaining each one and sharing my choice. Topics touch on include dark / light and left-hand / right-hand interface, brush cursor, Rapid Undo, QuickLine, Auto-hide interface, selection mask visibility, pressure curve, advanced gesture controls, eyedropper settings and QuickMenu. This video I go through and review the Procreate 4 Help menu, which has useful links to resources. In this video you’ll get to know how the default brushes of Procreate 4 are organized and get to see some examples of the individual default brushes. In this video you’ll learn several different ways to easily import third party brushes and brush sets into Procreate 4. The video shows how to import both individual brushes (.brush files) one by one as well as batch importing collections of brushes contained in zipped brush set folders. I show examples where the brushes are downloaded via the Procreate Community’s Free Brushes and Marketplace forums, using either only the iPad (including showing how to use a third party app, iZip Pro, to unzip files on an iPad) or using a combination of a desktop computer (Mac or PC) and the iPad. You’ll learn how to move imported brushes from the Imported brush set to any other brush set, or generate a new brush set for them by renaming the Imported set. You will learn how to utilize the Hue Ring and Value-Saturation Disc, Color Palettes, obtain hexadecimal code for web colors, and how to use the Eye Dropper tool. We review the basic structure and functionality of the layers in Procreate 4, explaining and demonstrating the difference between the Background color and regular image layers. You’ll learn how to import photos and use them as backgrounds over which to paint; how to rename layers, change their ordering in the Layers List; and adjust their opacity and blending modes. We start by reviewing how to set auto-backup to iCloud and how to manually back up your iPad data onto to your computer. Then we go over a recommended three step process for saving your artwork when you are working on it in Procreate or have finished it: saving the JPG and time-lapse replay video into your Photos Camera Roll and then auto-saving into the Procreate Gallery. Learn how to control and edit the visibility of an image layer in Procreate 4 using the wonderful and powerful new Layer Mask feature. This video shows how to use ColorDrop to fill a region with color and how to use Automatic Selection and Reference followed by Alpha Lock as two alternative ways to work selectively into a filled region. The JS Brushes set of twenty custom Procreate brushes is included in the IPAD ART EXTRAS tab in the left side-bar menu of PaintboxTV.com. 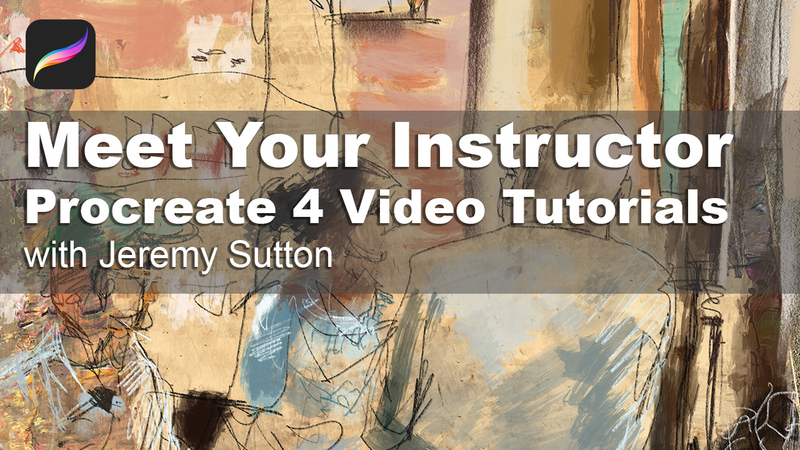 These video tutorials and the brushes are part of the content accessible through my subscription-based membership site PaintboxTV.com. Membership costs either $29.95/month or $199/year. You are welcome to join as a monthly member and immediately cancel your subscription so you can just enjoy the one month of access, which is what I suggest if you only wish to purchase the brush set. Besides the almost one hour total, so far, of Procreate 4 video tutorials posted, more will be added, including in-depth technical and artistic tutorials aimed at intermediate to advanced users. 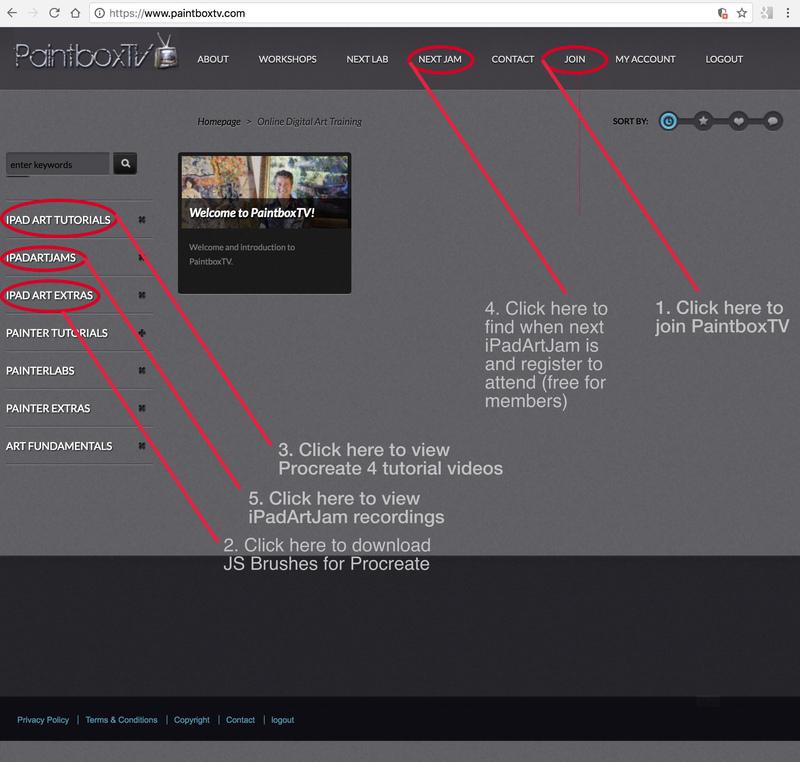 Also included as part of PaintboxTV membership is the monthly hour long iPadArtJams to which all PaintboxTV members are invited to attend in real time (it’s like an interactive webinar in which I demo, create art and answer questions) or watch the recordings later. If you have any specific topics you’d like me to create a tutorial on please let me know, I am open to suggestions! Click on the JOIN tab at the top of this page and choose your subscription option, monthly or annual. This series of videos is beginner level and has been created specifically for the new-comer to Procreate. I will be posting more advanced tutorials in due course, plus ones focusing more on sharing art ideas and process. My approach to teaching is to teach as I would want to be taught: explain things in a straightforward clear concise simple manner without jargon and without assumptions about prior knowledge, explaining terms when they arise, and ensuring that any step-by-step process is complete and that no step is missing. I know how frustrating it is when you try to follow something and one step is missing! These video tutorials are 720p resolution (1280 x 720 pixels), have high quality audio recorded using a Blue Snowball microphone, and include picture within picture and call out titles as needed. Originally from London, I studied drawing, sculpture and print-making at the Ruskin School of Fine Art and Drawing, Oxford University (while earning a degree in Physics), and subsequently studied at the Vrije Academie in The Hague, The Netherlands. I\'ve been using digital paint since 1991, including every version of Painter. I love teaching and have taught workshops and given presentations all over the world for the last twenty years. I create commissioned fine art paintings and perform live action painting and digital portraiture. I founded PaintboxTV in February 2009. Thank you for being part of this creative community!